The 2014 911 GT3 was debuted at the Geneva Motor Show in its new, fifth generation build as a completely redeveloped race-ready street car with a 0-60 of just 3.3 seconds. 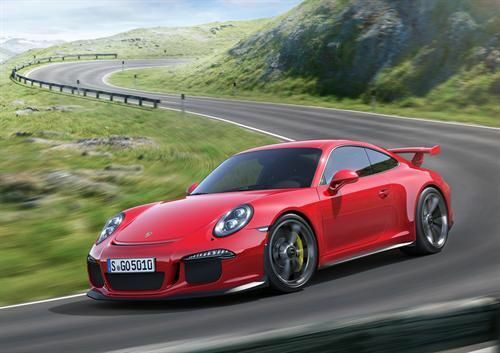 The all-new 2014 Porsche 911 GT3 has premiered at the Geneva International Motor Show in Switzerland. The car is completely re-designed for the fifth-generation rendition of the 911 GT3, marking the latest in a storied line of flagship Porsche sports cars with naturally-aspirated engines. During testing, the new Porsche 911 GT3 ripped through a 7:30 minute Nurburgring Nordschleife time and squealed into a 0-60 mph time of just 3.3 seconds towards a top track speed of a screaming 195 mph. We'll see the 2014 Porsche 911 GT3 go on sale here in the United States later in the year at a price of $130,400 (MSRP) plus destination. Several technical upgrades come with the new GT3, not the least of which is Porsche's first foray into active rear-wheel steering in a production vehicle. The obviously track-built 911 GT3 will bring extreme track performance to the street for its lucky owners, including unheard of cornering thanks to the new active steering in the rear. The powertrain is a 3.8-liter boxer putting out 475 horsepower with a 9,000 rpm redline and dual clutch transmission (PDK) to drive the rear wheels. The 6-cylinder engine comes from the Carrera S, up-tuned and re-fitted to give maxed out performance in the GT3. All of that growling power requires titanium connecting rods and forged pistons to stay contained in tune. Meanwhile, the PDK is based on a sequential gearbox (a la race cars) and improved for higher-load driving. Shorter gear ratios with closer spacing, faster shifting capability, and shorter travel on the driver's shift paddles mean more tactile feedback and faster running through the gears. In a Porsche first for production, the emergency "drop to neutral" maneuver by pulling both paddles is present on the 911 GT3. The active rear-wheel steering in the 2014 Porsche 911 GT3 gives better steering precision and improved lateral dynamics. Depending on the speed, the wheels will turn into or against the front wheels to improve stability and agility a swell as road grip. A fully variable rear differential lock and dynamic engine mounts add to this. Thanks to all of this plus new aerodynamics and chassis stability, the 2014 911 GT3 boasts a 0 to 124 mph time of less than twelve seconds. Any faster and you might need a G-suit..